In the high speed coring swivel seal assembly, the upper Kalsi Seal partitions the drilling fluid from the seal lubricant, and the lower Kalsi Seal retains the pressurized lubricant. 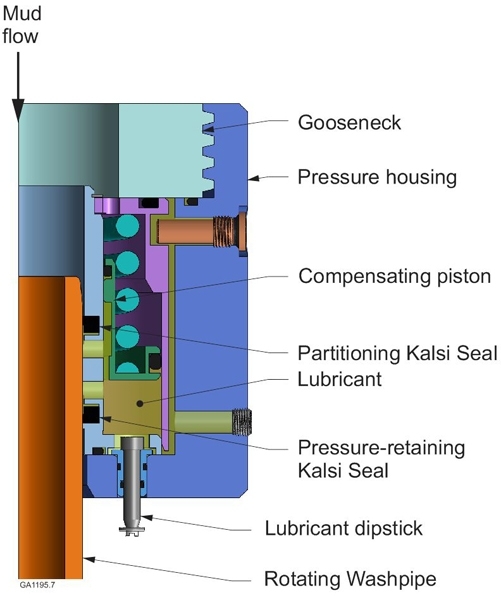 A spring-loaded piston amplifies the pressure of the seal lubricant above that of the drilling fluid pressure to improve the abrasion resistance of the upper Kalsi Seal. High pressure, high speed core drilling swivels present an extreme rotary sealing challenge, with pressure up to 3,000 psi (20.7 MPa) and surface speeds of 298 to 497 ft/minute (1.52 to 2.53 m/s). Conventional “Half-V” chevron-type washpipe packings were unable to survive for more than eight hours in this severe application. When Kalsi Seals were implemented in a washpipe/swivel assembly (below) that was designed and licensed by Kalsi Engineering, Inc., a seal life of over 1,400 hours was achieved in the first field use in 1987. Although several seal advances have occurred since then, the same hardware configuration is still in use today. The swivel uses two seals. The upper swivel seal serves as a partition between the high pressure drilling fluid and the clean lubricant, and the lower swivel seal retains the pressurized lubricant. A spring-loaded piston amplifies the lubricant pressure slightly above the drilling fluid, which keeps the upper swivel seal square in the gland. This feature helps to maximize the abrasion resistance of the upper seal. The swivel seals are mounted in a seal carrier that can move laterally at the time of assembly. The assembly procedure includes a step that causes the seal carrier to align itself on the floating washpipe. This alignment step permits the use of a small extrusion gap clearance, which increases the life of the lower swivel seal by minimizing extrusion damage. Kalsi Seals are also used as hydraulic swivel seals; for information, click here.